The makers of the Nabi line of tablets launch the first competitive/collaborative wearable created for kids and families. Fuhu may not be a big name on the global market, but its line of Nabi tablets for kids is well known on that specific niche. Earlier this week, the company released its first fitness tracker, also aimed at children. According to the official press release, the Nabi Compete band is "the first competitive/collaborative fitness tracker created specifically to meet the needs of kids and families." The highlights of the Nabi Compete include Bluetooth 4.0 connectivity, 3-color LED status light and a 3-axis accelerometer, all powered by a replaceable CR2032 battery that provides up to 3 months of autonomy. This wearable is splash and sweat proof, being able to sync with iOS and Android handsets within a 20 feet range. The connected apps provide various challenges, awarding points for unlocking and growing virtual pets. Nabi Compete comes in two-band packs that can be purchased from Target and Best Buy for a suggested retail price of $39.99 USD. These wearables are available in red, white, black, purple, and blue. For more details, please check the press release below. EL SEGUNDO, CA--(Marketwired - Nov 10, 2015) - Fuhu, Inc., the creator of the award-winning nabi® tablet and the foremost innovator in technology solutions for families, is entering the wearables arena with nabi Compete™ Competitive Bands For Kids -- the first competitive/collaborative fitness tracker created specifically to meet the needs of kids and families. 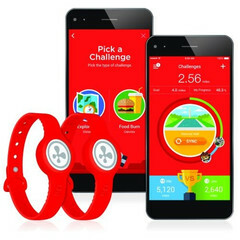 Fuhu is once again setting a new standard for kid and family focused technology by providing a product that not only tracks activity, but is designed to make fitness fun, relatable, and social in a way that enhances the understanding, importance and benefits of fitness and healthy habits. 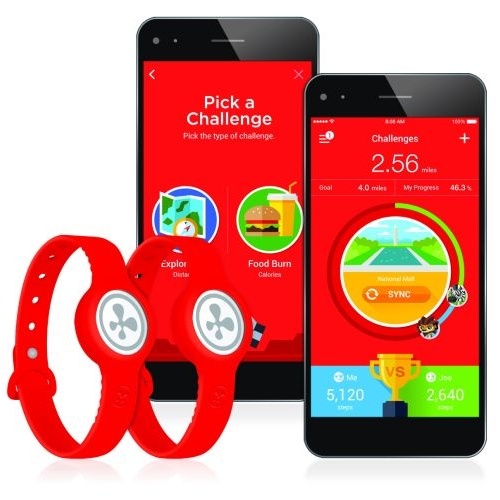 nabi Compete comes packaged with two kid-friendly bands that can be linked by downloading the nabi Compete app to open a first-of-its-kind, fun-filled competitive gamified approach to activity tracking. nabi Compete keeps kids motivated to encourage activity at an early age by competing against friends or family members in achievable real-world inspired challenges and garnering appealing rewards for completing tasks. nabi Compete is now available at Target and Best Buy for a suggested retail price of $39.99 for the 2-band packs. Jim Mitchell, CEO of Fuhu, said, "As we enter the wearables market, we wanted to find a way that would really utilize technology to help parents encourage their kids to get active in a fun way, not in a way that would be perceived as being a task. To that end, in designingnabi Compete we looked closely at what keeps kids engaged with gaming, social interaction, friendly competition and performance rising to the top of our list. With the launch of nabi Compete, we believe we have developed a product and platform that will excite kids, get them active at an early age and fuel their interest and awareness of the importance of a healthy lifestyle and personal fitness." nabi Compete is the first activity tracking product to package two wrist bands together, helping immediately encourage head-to-head and collaborative challenges between friends and family members. The sleekly designed device, which is targeted for kids ages 6 and up, makes exercise fun, rewarding, social and educational. The device includes the nabi Compete app and measures activity level in a gamified way to track steps and challenges based on real world places and landmarks, such as racing to the end of the Brooklyn Bridge or the National Mall Loop -- as opposed to just the number of steps children take in a day and the equivalent mileage. This provides children with a sense of achievement and motivates them to continue to stay active and make healthy decisions. Through use of nabi Compete, kids can also begin to learn the concept of calories. The app will show kids how many calories they burned off with each activity challenge through comparison of children's favorite foods like pizza, cheeseburgers and cookies to provide meaning behind the number of calories burned. To keep kids engaged, nabi Compete offers a reward-based system where kids can earn points and badges by being active, winning competitive challenges and completing activity goals with others. By reaching goals and earning "Go Points," kids can collect, grow and nurture a variety of virtual pets that can be used for a power boost advantage in their activity challenges. With nabi Compete, users can also share their mood via emoticons during challenges via access to Fuhu's safe friends network, nabi Konnect. Fuhu is offering a variety of wristband accessories for nabi Compete allowing users to style and personalize their tracker just how they want to express their individuality. nabi Compete marks the latest product in Fuhu's expanding portfolio of technology solutions meant to be accessible, affordable and enhance everyday living. Earlier this year, they also announced their entrance into the realm of Internet of Things, with groundbreaking devices in the baby and toddler space. Fuhu continues to set the trend in the kids tablet space as well with their award-winning nabi Tablet line which includes the recently launched, first-ever subscription tablet, nabi Pass Tab, and nabi Elev-8 which is the most advanced kid-focused tablet on the market with an 8-inch screen and the latest android platform. In addition to several recent product debuts, Fuhu has been the recipient of a series of prestigious accolades. These include Fast Company's Most Innovative Companies 2015 list as the #4 most innovative company in the consumer electronics industry and #24 most innovative company overall worldwide. In 2014, Inc. Magazine named Fuhu the #1 Fastest Growing Company in America for a second consecutive year and Forbes named Fuhu the #1 Most Promising Company in America.